Nearly six-in-ten adults (58%) have done research online about the products and services they buy, and about a quarter (24%) have posted comments or reviews online about the things they buy. 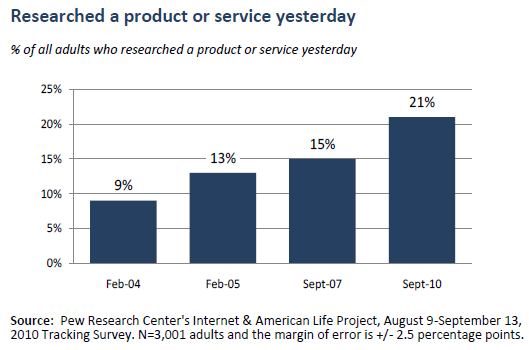 On a typical day, 21% of adults search for product information online. This is an increase from 15% in 2007 and 9% in 2004. The share of adults who report having at least occasionally conducted product or service research online has also increased – from 49% in 2004 to 58% in 2010. The 2010 data come from a telephone survey by the Pew Research Center’s Internet & American Life Project conducted between August 9 and September 13, 2010. The survey was administered to a sample of 3,001 adults, age 18 and older, using a combination of landline and cellular telephones. Interviews were conducted in English or Spanish. The sample margin of error is plus or minus 2.5 percentage points for the general population and plus or minus 2.9 percentage points for internet users (n=2,065). Among internet users, 78% say that they at least occasionally conduct product research and 32% report that they have posted online product comments. The proportion of the general population that has bought products such as books, music, toys or clothing online rose from 22% in May 2000 to 52% in the Project’s May 2010 survey. The proportion of the general population that has made travel reservations or bought travel services such airline tickets, hotel rooms, or rental cars rose from 18% in May 2000 to 52% in the Project’s May 2010 survey. The sharing of product and service information also coincides with increasing use of social networking sites, with 46% of Americans reporting the use of internet sites such as Facebook or LinkedIn. That is an increase from the 5% who reported using social networking sites when the Project first started asking about them in a survey in February 2005. Such sites might be informal channels of commercial information that are shared in social networks, though the Pew Internet survey did not specifically address this aspect. Who is conducting research online for product or service information? Men and women conduct online product research at similar rates. Online African-Americans do product research at significantly lower rates than do online whites or Hispanics. Online adults who are ages 65 and older do significantly less online product research than those in the 30-49 and 50-64 age groups. Internet users in higher income brackets do more online research than those in lower income brackets. Online Americans who speak English do more online product research than those who are Spanish speakers. There is no significant difference in online product researching among rural, suburban, and urban internet-using adults. Some 83% of broadband users report doing online product research, compared with 67% of non-broadband users. Among internet users, there are only small differences by gender, race and age in the likelihood of posting online product reviews. Among internet users, those with college degree or more (38%) are more likely than those with a high school diploma or less (27%) to post product reviews online. Among internet users, those in the higher income brackets are more likely than those in lower income brackets to post product reviews. English-speaking online adults are more inclined than Spanish-speaking adults to post product comments online. Fewer rural adults post product or service comments than suburban or urban adults. And a significantly higher percentage of adults with broadband report posting comments than do those without broadband.